ROME -- Located in the crowded Buffalota neighborhood north of Rome near a gigantic shopping center, the spires of a huge new Mormon temple make a striking addition to the Roman skyline. To be inaugurated in March, the 40,000-sq. foot building, under construction for a decade, covers 15 acres which include fountains and gardens. Inside is a roomy visitors center plus a family history center that will be open to the public. 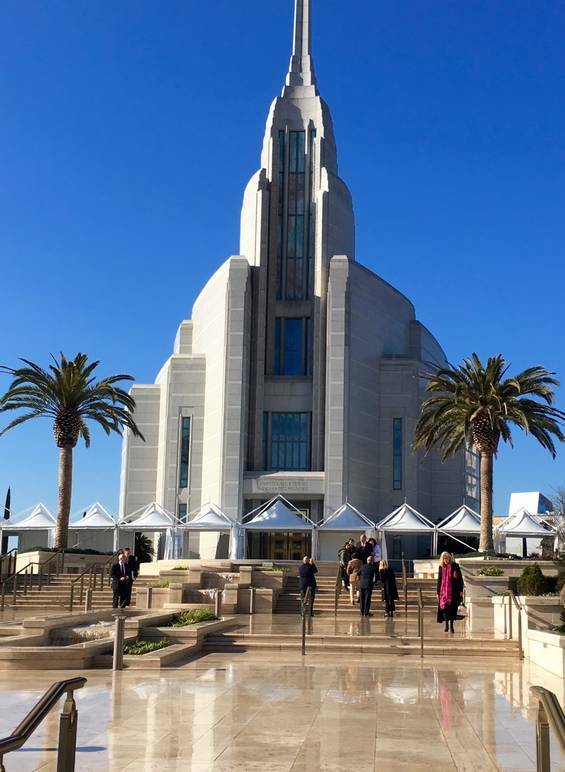 The entire temple is described as "religious and cultural center," . 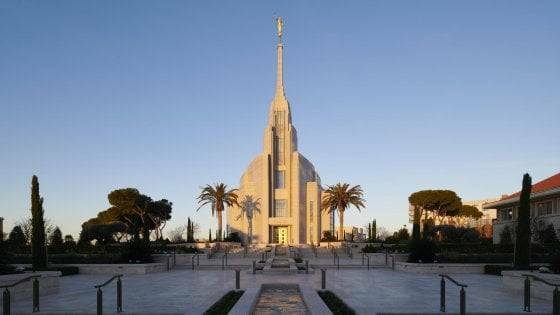 Of the 162 temples worldwide, this is the 12th to be built in Europe and the very largest; another is to be built in Portugal. The Rome congregation of the Church of Jesus Christ of Latter-day Saints (the formal name) vaunts 5,000 members while all told Italy hosts some 26,000, scattered in 100 congregations. The relationship with Italy began when a Sardinian immigrant to Boston, Mass., named Giuseppe Taranto, known in the US as "Joseph Toronto", was baptized there and then returned to Italy with two fellow American Mormons in 1849. These early Mormon missionaries were particularly active in Piedmont, where they made proselytes in the Waldensian territory. In the visitors center is a wall-sized, five-panel stained-glass mural depicting scenes from the life of Christ. 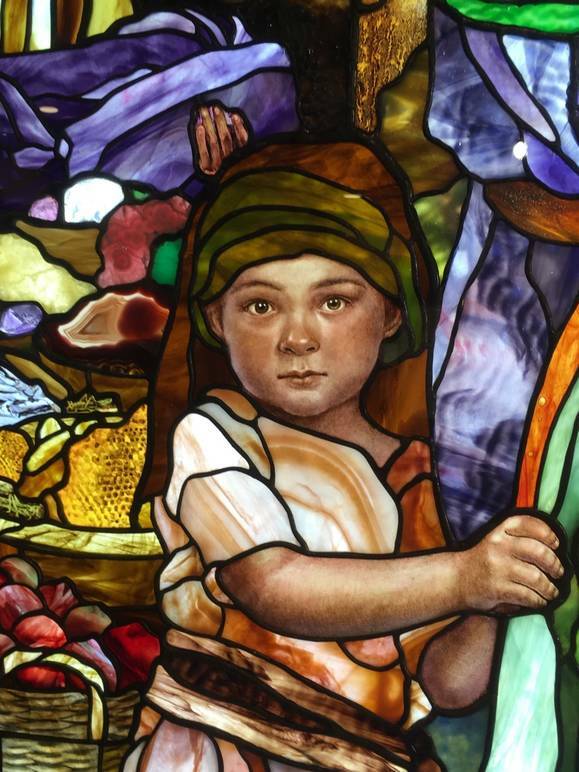 Under the direction of artist Tom Holdman, 25 skilled assistants cut by hand and installed 6,000 pieces of colored glass. Incorporated in these stunning panels are gold coins that date from Jerusalem in the time of Christ plus salt from the Dead Sea and a shell from the Sea of Galilee. In an adjacent rotunda are life-sized statues of Christ and the Twelve Apostles which replicate those created by the famous Danish sculptor Bertel Thorvaldsen for the Church of Our Lady in Denmark. Thorvalsen, who spent much of his life in Italy, is the only non-Catholic sculptor to have carved a funeral monument in St Peter's Basilica for Pope Pius Vii. 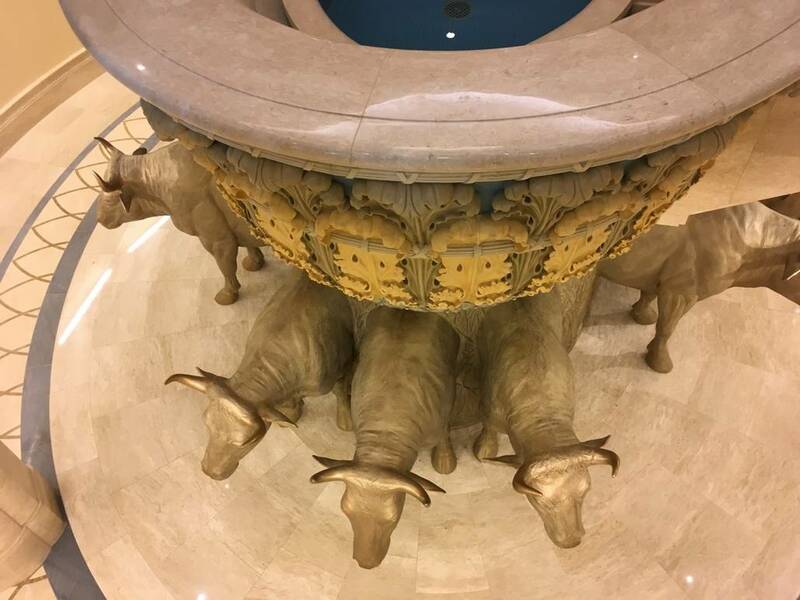 "The church is growing, and this new temple can be a determining factor in encouraging people to discover our church," said Elder Massimo De Feo. The aim is for the temple to be a place to know and to appreciate, he added. Unlike most Christian churches, the two spires soaring into the sky are not atop large places of worship. Inside are a series of fairly small rooms in which the aim appears to be a family-style friendship and intimacy. In its design energy efficiency including solar energy loomed large, with predicted savings of over 50% over building code minimums. Speakers also made clear that a key goal is to demonstrate their activism in Italian civil society, including with helping migrants. In recent years the Mormon church has made conscientious efforts to work together in charity projects with other organizations in Italy, including the Vatican and Roman Catholic religious communities here. In 2015, 14,000 hygiene kits were prepared and distributed in collaboration with the Roman Catholic Sant'Egidio Community in Milan, Calabria, Palermo and Rome. That same year the Mormons donated to the Italian Red Cross a camp kitchen for preparation of 900 meals daily for the needy. The following year another 6,000 hygiene kits were prepared and delivered for distribution to Sant'Egidio in Rome. by The Mormon youth organization in Venice prepared another 3,000 such kits -- they included diapers, toothpaste, soap, toiletries -- distributed to refugees arriving across the Alps into Italy. Packages of underwear and shoes went to the underprivileged in Rome, and aid to the victims of the Perugia earthquake zone in 2016.